Quality hay has a high nutritive content (including crude protein and digestible energy) and a high intake and acceptability. It is low in cell walls and fiber and free of defects, such as dust, musty odor, mold, and excessive foreign material. Hay quality really means feed value and should be evaluated accordingly. The factors known to influence hay quality and animal performance include the following: 1) stage of maturity at harvest, 2) leafiness, 3) color, 4) foreign material, and 5) odor and condition. 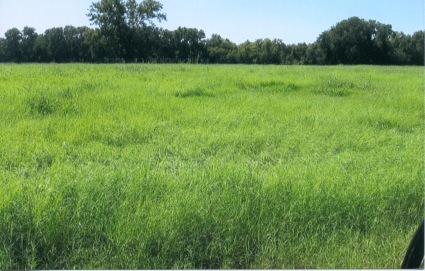 On our irrigated land, we cut our hay every 28 days and fertilize after every cutting. We harvest hay the later part of May through October. Hay quality can differ widely even within a single species grown in the same locality. Farms producing livestock and livestock products can save money by feeding more high quality hay and less grain per animal unit. 1. Has the hay been fertilized this season? 2. What are the protein/TDN levels of the grass? 3. Have fields been used to pasture livestock?